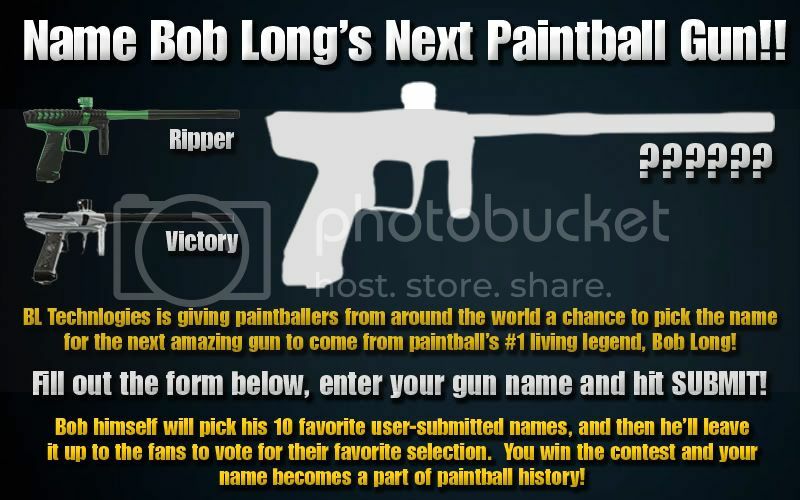 The legend himself, Bob Long, is giving paintballers the opportunity to become a part of paintball history and name the next gun to come out of the BL Technologies factory. That's right, YOU PICK THE NAME! All of the names up for the voting process will be created and submitted purely through the fans, not even Bob himself will put in a name suggestion for his new gun, it's 100% in the hands of the customers. Fans will have about two to three weeks to submit their favorite names. Right before the Living Legends event in Chicago, Bob will sit down and choose his ten favorite fan-submitted names. Then the ten names will be put into a poll where once again the loyal BL Technologies customers will be able to vote on their favorite of the ten. The winner of the poll gets their name chosen as the official title of the next Bob Long gun! Hurry and submit your choice now before time runs out!